On the border with Morrowind, the Shadowfen region has had more contact with Tamrielic civilization than most of Black Marsh—due primarily to the activities of the Dunmeri slavers who once operated out of the city of Stormhold. Now the Argonians are back in charge. Shadowfen is the northwestern region of Black Marsh. It is a fetid mire, often fought over by the Imperial Legion and Dunmer slavers. The ancient city of Stormhold is located here, the source of the devastating (to non-Argonians) Knahaten Flu. Local creatures include giant snakes, fleshflies and wamasu, and diseases such as blood rot, the droops, and swamp fever are quite common. Though the practice of Argonian slavery was abandoned when Black Marsh joined the Ebonheart Pact, rogue Dunmeri slave traders can still be found roaming the marshes. Hist trees and ruined temples can also be found along the winding channels and dank foliage. 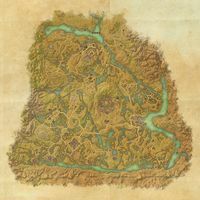 The region borders Morrowind to the north, and Cyrodiil to the west. It is also home to the Shadowscales, those Argonians born under the sign of the Shadow, and thus destined for a life in the Dark Brotherhood. Cold-Blood Cavern — A cave system and Daedric ruin located in northwestern Shadowfen. Paths always enter a quest from the top or left, and leave a quest from the bottom or right. Denotes an optional path or quest. The subsequent story quest can be started without this being completed. Denotes an exclusive path or quest. Only one of the connected quests is required, and only one can be completed. Denotes a story quest which is required for Cadwell's Almanac. Denotes a missable pointer quest which is part of the main chain. Denotes a missable pointer quest which is on an alternate path. Denotes a side quest which is required for Cadwell's Almanac. Denotes a quest which rewards a Skill Point. Three Tender Souls: Solve a series of crimes in Stormhold. Getting to the Truth: Find the missing vicecanon. Scouring the Mire: Investigate suspicious Dominion activity in Reticulated Spine. Trail of the Skin-Stealer: Prepare to fight the Dominion near a Daedric ruin. The Skin-Stealer's Lair: Defeat the Skin-Stealer impostor. Cracking the Egg: Travel to the Hatching Pools to learn more about the Mnemic Egg. Keepers of the Shell: Save a generation of Argonians from the Dominion. The Mnemic Egg: Follow the Mnemic Egg into the Venomous Fens. The Dominion's Alchemist: Find the Dominion's alchemist. The Dream of the Hist: Defeat the alchemist and recover the Mnemic Egg. Hushed Whispers: Report on Dominion activity in Stormhold. Eyes of the Enemy: Warn the Vicecanon of betrayal. Children of the Hist: Hurry to the Hatching Pools to save the Argonian hatchlings. The Bargain's End: Decide the fate of Stillrise Village. Bound to the Bog: Help out the expedition to Bogmother. Captive Souls: Free the souls of a merchant's slain guards. Foreign Vintage: Find the spies in Sanguine's celebration. A Last Reminder: Bring a last memento to a widow. Life of the Party: Help a trapped Argonian escape. Saving the Relics: Recover some ancient Argonian relics from Bogmother. Schism: Help Mud Tree Village reopen their mine. Shadowfen Smorgasbord: Help a drunken cook out of a bad bet. The Thin Ones: Save a Kothringi village from undead servitude. Unbridled Wealth: Recover a merchant's wares and her favorite guar. Unwelcome Guests: Convince a band of mercenaries to leave Stormhold. Broken Apart: Banish the wispmother that is corrupting Deep Graves. Buried in the Past: Gain access to the ancient ruins at Sunscale Strand. Clarity: Cure Ja-Reet of his mysterious silence. Cold-Blooded Revenge: Seek vengeance for the lone survivor of a Dominion massacre. The Fangs of Sithis: Find the Fangs of Sithis in the Sunscale Ruins. Into the Mire: Rescue the Mire villagers from the Dominion. Last One Standing: Put an end to the Khajiiti upstart threatening the Argonian captain. A Life of Privilege: Help a lost Breton recover her belongings. Lost to the Mire: Help find a missing friend. Missing Son: Find out what happened to an Argonian's son. Outside Interference: Discover the purpose of the Dominion's extractor at Hatching Pools. A Pirate Parley: Recover the Dominion's treasure and ensure the gerent gets his freedom. Pull the Last Fang: Recover a Fang of Sithis from the Renrijra Maor. A Stranger Uninvited: Investigate an Altmer researching the Argonian graveyard. Strength of the Father: Help cure a sick Orc. Threefold Folly: Win back a lute in a game of riddles. The Tree-Minder's Fate: Help put a spirit's mind to rest. Warm Welcome: Find out who the Dominion are making deals with in Alten Corimont. Whispers of the Wisps: Rescue the travelers trapped by wisps in an Argonian cemetery. Will of the Broken: Deliver a cursed urn to a priestess of Arkay. And Throw Away The Key: Assist the inmates of White Rose Prison. Captured Time: Discover the secret of the Alasil pilasters. Catch the Lightning: Convince a reluctant assistant to help with an experiment. 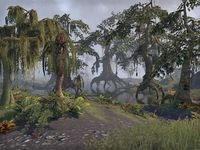 Deep Disturbance: Discover why the swamp is attacking an Argonian settlement. Dreams From the Hist: Discover why a Dominion soldier would undertake the Trials of the Hist. A Final Release: Locate the remains of an Argonian separated from the Hist. Into the Temple: Find the Keystone at Zuuk. The Keystone: Recover the keystone from the prison dungeon. King of Dust: Stop the Dominion from getting Zuuk's keystone. Lost Pilgrimage: Help find a group of lost pilgrims. Missing in the Mire: Rescue some scavengers from the hostile creatures of the swamp. Of Dubious Value: Help find some stolen relics. The Ones Left Behind: Reunite the spirits of a Khajiiti family. Overrun: Meet up with the Shadowscales at Murkwater. A Poisoned Heart: Help clean up some poison gas. Riches Beyond Measure: Help find a powerful Ayleid artifact. Scales of Retribution: Help defeat the Dominion at Murkwater. The Swamp's Embrace: Recover the bodies of the Dominion's Argonian prisoners. Trials of the Burnished Scales: Pass the trials of the Hist in Hissmir. Vigil's End: Help an ancient Ayleid spirit find rest. What Happened at Murkwater: Let Hissmir know of the events at Murkwater. Force of Nature: Help three nereid sisters reclaim an abandoned Imperial fort. Pledge: Arx Corinium: Prove you are truly Undaunted by clearing Arx Corinium. Pledge: Ruins of Mazzatun: Prove you are truly Undaunted by conquering the Ruins of Mazzatun. Sap and Stone: Eliminate the Xit-Xaht threat in the Ruins of Mazzatun. This page was last modified on 28 February 2019, at 22:23.